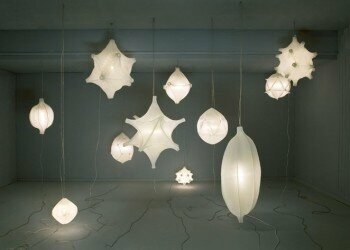 Dutch designers Anke Bernotat and Jan Jacob Borstlap of Bernotat & Co. have used 3D printing to create “Radiolaria,” a collection of eleven glow-in-the-dark lamps inspired by underwater microorganisms. Ernst Haeckel was a German biologist who discovered, described, and named thousands of tiny new species. He is also famous for his work on radiolaria; tiny, microscopic protozoa which produce complex mineral skeletons. His life ended in 1919, but his work continues to live on, providing the inspiration for the collection of lamps. To create the lamps, the 3D printed structures are first printed and covered with 3D knitted textiles with a glow in-the-dark-effect. Borstlap and Bernotat used this process to produce eleven different lamps that mimic the organisms that were discovered years ago by Haeckel. The result is a dreamy atmosphere that mimics an underwater world. In addition to being atmospheric, the lamps are practical as well, they act as a point of reference so you don’t bump into your bed. “In a completely dark room, the lamps glow as the textile has been sewn together with a glow in the dark material. It creates a dreamy kind of atmosphere in your bedroom,” the studio said. The lamps were on display in Milan from April 8-13.